An essential skill for any trout fisherman is the ability to read the river and then work those areas that are more likely to yield worthwhile fish. Here’s an excellent article by Charlie Robinton, a fly fishing instructor who lives in in San Francisco and who loves to share his passion for fly fishing and the outdoors. Oxygen: Trout need to breathe in order to live. In a river you will generally find trout close to current where the water is more oxygenated. Food: Trout need to eat and will seldom stray far from a food source. Find the food and you will find the fish. Shelter and Rest: Trout like to be near current, but they are also quite lazy. They like to find objects to rest behind, and other areas where they can sit outside the main flow. They also need a place to hide from predators. Before making your first cast, take a moment to “read” the water. Riffle: A riffle is a rocky, shallow area in a stream where water cascading over rocks creates a noticeable surface disturbance. The shallow, highly oxygenated water is a perfect environment for the aquatic insects trout eat. Boulders and rocks create plentiful hiding and resting spots. Deeper water downstream gives trout rest and security. Run: A run is an in-between zone directly below a riffle, where the water becomes deeper and the current is more uniform. Aside from a riffle, a run is one of the top places to look for trout in a stream. Pool: A pool is the deepest portion of any given section of river with the slowest current. Fish will often retreat to a pool on bright, sunny days or if they feel threatened. 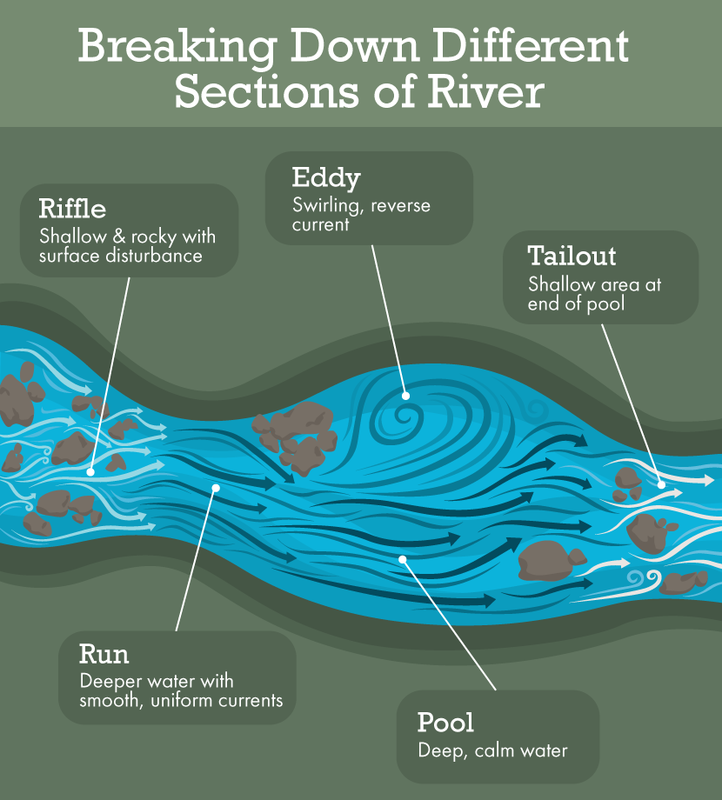 Eddy: An eddy is an area of the river where structure such as an indent in the riverbank, a log, or a large boulder blocks the current flow and influences its direction. 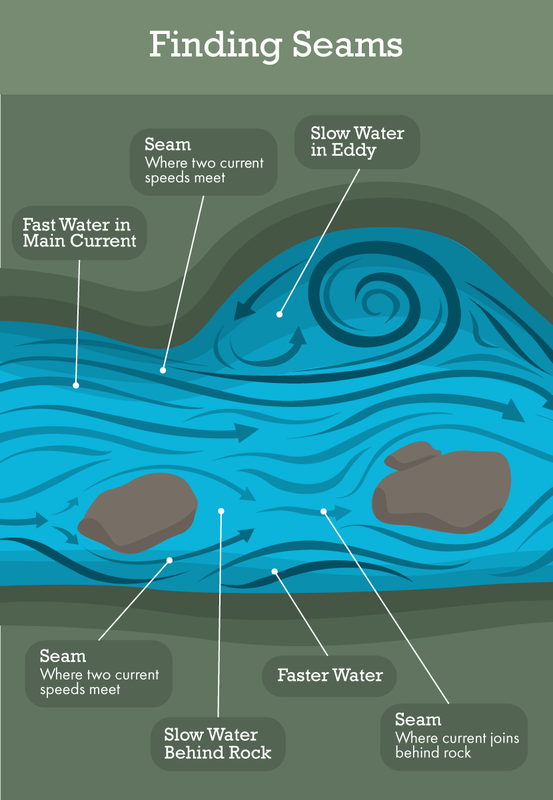 Directly downstream of the object, a pocket of swirling water will form opposite the main direction of current flow. Tailout: A tailout is a shallow, flat section at the end of a pool before the water spills over into another riffle. Structure can refer to objects in and around the river such as boulders, gravel bars, holes, and changes in bottom contour. Less obvious examples are eddies and current seams created by the river flow, or shade from a high bank. Boulders, logs, and other obstructions: Any object that impedes the current flow is worth investigating. Multiple casts placed upstream, to the side, and downstream of the object will give you a shot at any fish that may be sitting there. Changes in the river: Bends, gravel bars, shelves, holes, and other changes in the river or bottom contour are great places to look for trout. Other good locations are the insides of river bends, points jutting into the current, and indentations along the bank. A good pair of polarized sunglasses can help locate structure hidden below the surface. Dark areas often signify deeper holes. Look for gravel bars mid-river, and drop-offs or shelves at the river’s edge where the current begins to slow. Fish will be resting and feeding on the deeper side of these areas. A “seam” is any spot where two currents converge. 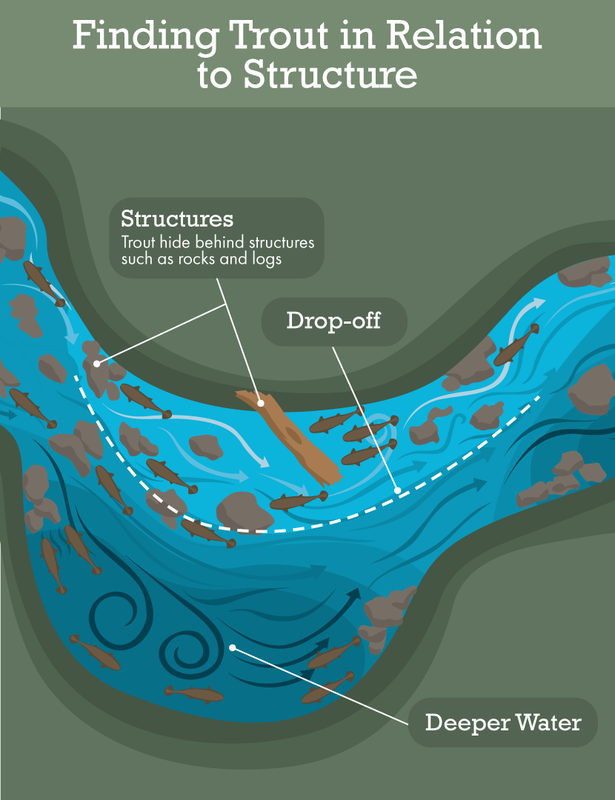 Trout like seams because the joining currents create feeding lanes that collect drifting food, so when looking at any structure in a river it is important to locate any associated seams. Watch the current carefully as it flows over and around structure. Look for bubble trails floating downstream or any area where there is a noticeable difference in current speed. Spend a few minutes reading the water before making a cast. Decide which structure you are going to target. When you do catch a fish remember the key features of the area you were fishing. Eventually reading the water will become an intuitive skill that will lead you to more fish. Thanks to Fix.com for this extract.